For the first few days you have your new puppy home, it is a good idea to continue feeding the same type and brand of puppy food and use the same feeding schedule the puppy was on before he came to you. Then you can slowly start using the food you have chosen based on information you received from the breeder and veterinarian. A pet needs to be switched to a new food slowly to prevent intestinal upset. By ‘slowly’ we mean over the course of 7-10 days go from feeding 100% of the previous food to 100% of the new food. For example, make a mixture that contains 25% of the new food and 75% of the old food and feed that for several days. Then make it 50-50 for several days, then 75% new food to 25% old food for several days. Then you can start feeding 100% new food. If at any time your puppy starts vomiting, or has loose stools or appears constipated, slow the rate at which you are switching him over. There are three forms of commercially produced dog foods: dry kibble, semi-moist (sealed packages), and moist (canned). Most trainers and veterinarians recommend dry kibble food. We rarely recommend canned or the semi-moist foods. Canned foods are typically higher in fat and are usually 80 to 83 percent water. That makes them pretty expensive if you squeeze out the top 4/5 of the can. The semi-moist foods are about 55% water and use high salt or sugar levels for preservation. Again, you are paying too much for water and puppies do not need the salt and sugar. Dry foods are only 9 to 11 percent water and are made of the same quality ingredients as the other types. They are more economical, easier to use, and in our opinion, better for your dog. With dog food, you pretty much get what you pay for. Economy brands are cheap and are made of the cheapest ingredients available. As such, their energy values are lower, and most importantly they often use poorer-grade proteins with lower digestibility, which means much of the food passes right through their system and is not absorbed. Premium brands, which include those classified as Super Premium and Performance, use higher quality ingredients from sources with higher biological values. Because better quality ingredients mean better digestibility, your puppy does not need to eat as much and less waste is produced (which means less to pick up in the yard). Regular brands, as you could guess, fall somewhere in between. Remember, the back of the dog food bag does not tell the entire story, including important information like percent digestibility – how much of the food your puppy’s body will actually use. Talk to your veterinarian about the best food for your dog. At Vale Vets we sell Hills. It’s a very well balanced food offering your puppy every dietary requirement through every stage of his or her life. The only thing we dislike more than canned or pre-moistened foods for dogs is table scraps. We strongly recommend never starting because once you do, it never stops. Most nutritionists believe that dogs that are on a good quality commercially prepared dry food are nutritionally better off than their owners are. This has been shown in many studies. Table scraps are usually higher in calories and certainly are not balanced. Neither are they fortified with the vitamins and minerals that dogs require. Table scraps could cause diarrhea or other gastrointestinal problems. Table scraps fill them up, but do not provide the nutrients their rapidly-growing bodies need. Feeding them from the table teaches them the bad habit of begging and may make housetraining more difficult for you. The puppy’s feeding schedule will be somewhat dictated by your own personal schedule. We do not want to leave food out for the puppy so that he can eat it whenever he wants. You need to be there for the feedings because you want the puppy and his entire body on a set schedule. This is best accomplished by feeding the pup what he will eat at specific times on a specific schedule. 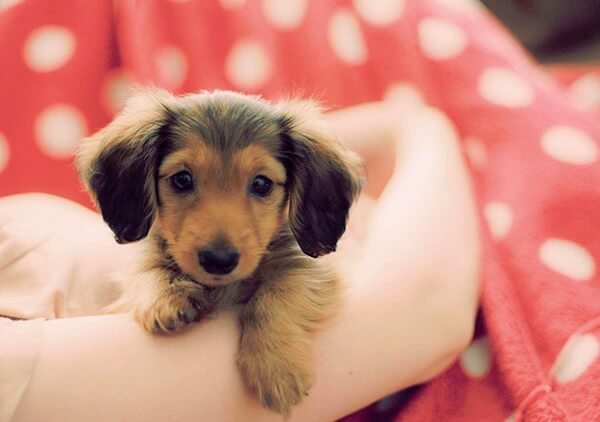 Puppies under six months of age should be fed three times daily; after 6 months they may be fed twice daily. By feeding on a set schedule, the dog will then go to the bathroom on a more set schedule and make housetraining easier and faster. Make it a habit to give the puppy some quiet time after the meal. Do not let the children romp and play with him for the first hour to an hour and a half after eating. This can lead to some stomach upsets that can sometimes be very serious. The puppy will probably need to go to the bathroom, however. The amount of food given with each meal should never be dictated by what is on the back of the puppy food bag. That is a good place to start, but from our experience, many puppies need less than what is on the bag, and a few may need more. 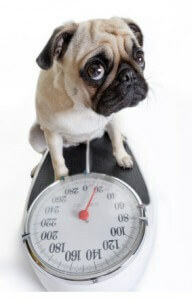 Adjust the amount fed to maintain your puppy at an optimal weight. Your veterinarian can help you determine the proper amount to feed to keep your puppy at optimal condition. Remember to have water available with or immediately following the meal. One of the common complaints that veterinarians hear from dog owners, especially those with animals less than 18 months of age, is that they never eat enough. The owners feel the dog is not putting on weight or growing as fast as they think she should. They are tempted to somehow encourage their animals to eat more. Do not do it. The growth rates and appetites of young animals on a good quality food are primarily dictated by their genetics. Do not try to make your dog grow faster than she should or into something she is not. This will only cause problems. Artificially accelerated growth leads to bone and joint disorders. Feed them the amounts they want and let their bodies dictate their needs. Treats should never account for more than 10% of your puppy’s caloric intake (which is not much in Toy breeds). Your puppy’s food is his sole source for the nutrition he needs, so do not ‘fill up’ your puppy on treats before meal time. Hard chew treats keep your puppy entertained and may improve dental health by exercising the gums and scraping the teeth. It also satisfies your teething pup’s need to chew. Treats can be used during training to reward good behaviour, but be careful not to overdo it. Puppies may seem to drink large quantities of water. They need water and cannot be deprived of it. A dog or cat can lose almost all of his body fat and half of his protein mass (muscle) and still survive. However, if this same animal loses 15% of his body water, he will die. Water is the most important nutrient of all. For dogs of any age that eat dry food, water will be needed to rehydrate it in their stomachs for digestion. Puppies also need more water per pound than adults do because they are growing. Growth comes through very active metabolism at the cellular level. These processes produce many wastes and by-products that are excreted into the blood. It requires plenty of water to carry these substances to and be flushed through the kidneys. It is okay to schedule when your puppy drinks, but on a daily basis you must allow her to consume what she wants and needs. Providing fresh, clean water is important. Infectious agents and diseases such as leptospirosis,Giardia, E. coli, and Cryptosporidium can be transmitted through contaminated water sources. Providing fresh, clean water greatly reduces the risk of disease and therefore keeps your pet happy and healthy.